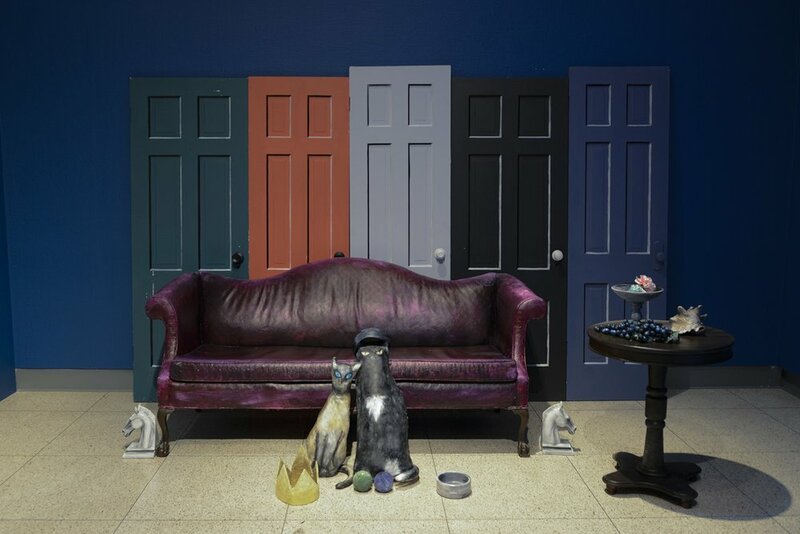 The installation by Donna Castellanos has two cats to be posed, a couch and the doors, just as they can be seen in Abercrombie’s paintings. Visitors come through to take their own pictures inside the installation as if they are within one of Abercrombie’s paintings. Image courtesy of the Illinois State Museum. The dark gray-blue walls of the new exhibition at the Illinois State Museum of Chicago artist Gertrude Abercrombie’s work beckon the viewer to enter into the surreal rooms of her mind. With several standalone installations with painted furniture and a single pedestal with a column, doily, and cup Abercrombie actually used to paint the still life behind it, we are led even further into the depths of her mind. 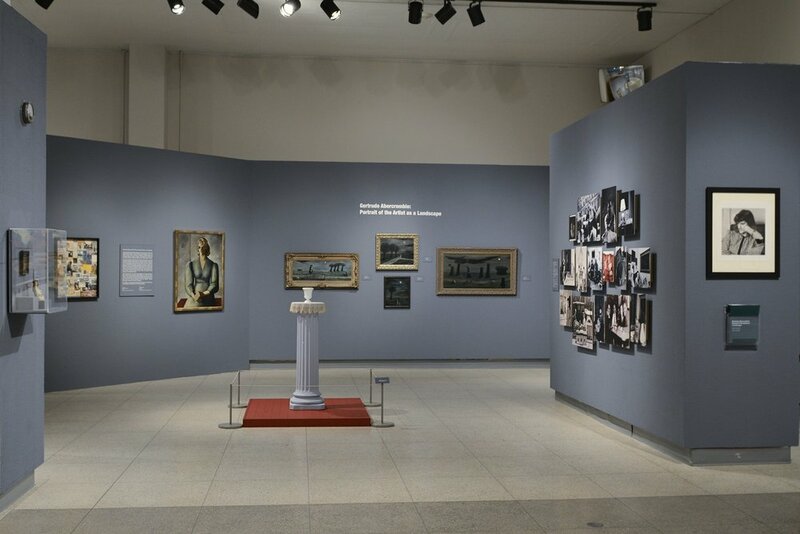 The entrance to the Abercrombie exhibition with dark gray-blue walls, a photo of her hangs to the right, on the back wall are several of her paintings and in the center is the still life display mentioned above. Image courtesy of the Illinois State Museum. This exhibition not only gives us a look at work by Abercrombie in a variety of media from a variety of decades, but it also gives us a look at the woman behind the work. With pictures of her with friends like Sonny Rollins and Dizzy Gillespie, pictures of her in her own home with her cat and surrounded by her work. Gertrude Abercrombie liked to think of herself as the “Queen of Chicago”, and among her circle, she surely was; hosting weekend jam sessions, evenings of revelry, and all night parties as well as being a creative spirit making work that won awards at the Art Institute of Chicago and was received fairly well in her lifetime. All this made her “the queen.” However, her life was troubled too. On a wall adjacent to the many photographs of Abercrombie smiling with friends and beside her work there are four paintings of Abercrombie wandering down barren roads in the night away and towards herself. In the next room, we see paintings of rooms that are empty except for maybe a cat and a flower or a screen. The rooms are lonely and one must suppose that Abercrombie was too. But no one has ever said it was easy being queen. And one can only imagine how isolating it was to reign over a large group but always be above them, never by their sides. 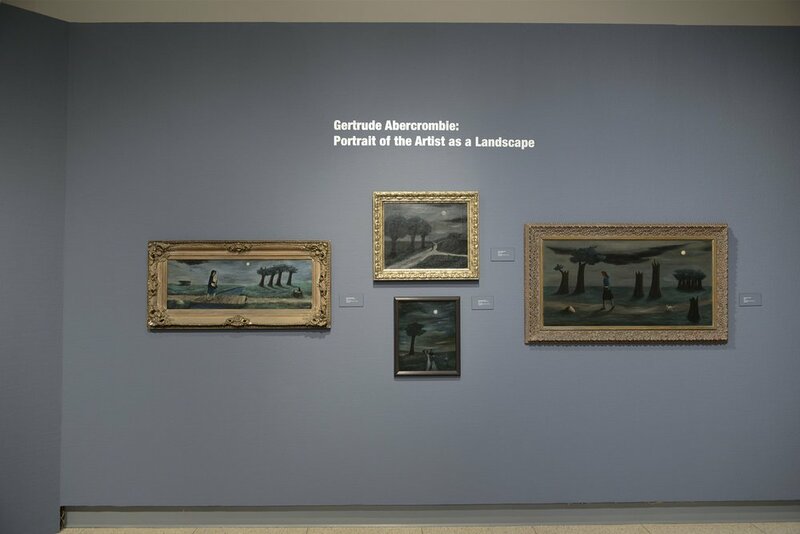 The back wall of the Abercrombie exhibition has four paintings, each of Abercrombie walking along a moonlit path. Image courtesy of the Illinois State Museum. This surrealism is fun though. With hidden cats with sweet, bright eyes, and little pink tongues, paintings within paintings, and subject matter that is recognizable and isn’t frightening or isolating. There are eggs and cats and keys and wishbones, but none of it leaves one in a surreal nightmare. Instead, it leads you to the mind of an artist and lets you see symbols and objects that she felt represented her and what she knew. The gloves are a piece of Abercrombie’s past, when she was illustrating advertisements. These images while not of Abercrombie’s physical form represent her, who she saw herself as in her mind and the pieces of her life which came to become her. There are several self-portraits in the exhibition as well showing her face and torso. They are full of curly hair and bright eyes, and in the largest, we see her in an almost cubist style with what struck me as an incredibly strong presence, with broad shoulders and a solid dress, she sits looking downward, taking up space. Looking through the exhibition there is a bright blue wall with a chair, cat, image of Abercrombie and a radio playing the music of Abercrombie’s close friends Dizzy Gillespie, Sonny Rollins, and others. On the surrounding walls are many more works by Abercrombie. Image courtesy of the Illinois State Museum. In the final room of the exhibition, we are given the ability to take ourselves out of the museum and into Abercrombie’s paintings in Donna Castellanos’ installation. With doors and a cloud atop a ladder and several cats around the room, we go deeper still into Abercrombie’s mind, becoming one with it. No longer are we onlookers, we are the subjects. We can sit with a cat in our lap or become an object in one of Abercrombie’s paintings. We can even become the artist herself, donning a crown and standing under a tree with a full moon and an owl. In a museum where the kids outnumber the adults most days, it is an incredible way to get them ‘doing’ rather than looking. The work at the Illinois State Museum was donated by Abercrombie herself to be a part of the permanent collection, and in the 1970s a large collection of work, a huge archive of photographs, and supplementary documentation was donated by Abercrombie’s daughter. 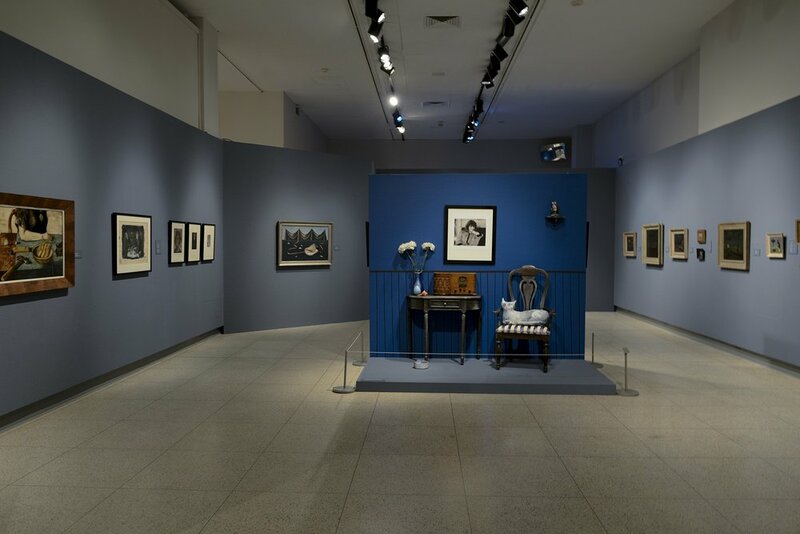 In addition, Gary and Laura Maurer and Susan and Michael Weininger have lent their expansive collections of Abercrombie’s work to the museum for this show. All of this leads to a large body of work that is not only beautiful, but revealing of the woman behind the work. The most recent retrospective of Abercrombie’s work was almost thirty years ago, so not only is this work beautiful, it’s new work to many people. I had heard her name, but had never seen her work, at least not in person and together in this way. This is exciting because now so many artists of Illinois and elsewhere can come, see her work, learn about her life, and continue to carry her story and the ideas of her work forward in their own work and lives. I know that I have been so drawn to her and that her work has become one of my favorites. Maybe that is because I love cats or I find a loneliness in my own life echoed in her work, but I think there is something there for everyone. As with any exhibition you take what you need away, but there seemed to be much that I needed in Abercrombie. This exhibition runs through June 10th at the Illinois State Museum in Springfield, IL at 502 S. Spring St. The Museum is open Monday to Saturday from 9:30-4 and Sundays from 11-4:30. Samantha recently graduated with an art history degree and a history minor from Illinois State University where she worked at University Galleries and cometogetherspace. She has also had experience at the Frye Art Museum, James Harris Gallery, and MOHAI in Seattle. She currently works at the Illinois State Museum in Springfield, Illinois as an assistant in the departments of art and decorative art.